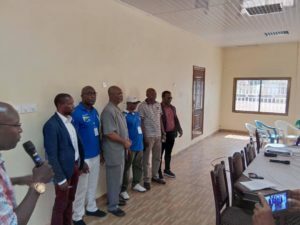 Dr. Patrick Coker has been re-elected unopposed as President of the National Olympic Committee of Sierra Leone (NOC-SLE) on Saturday, 12th January, 2019, at the OlympAfica Centre, Goderich. Dr. Coker will serve his final term which will run until 2023- a year after Birmingham Commonwealth Games. The re-elected NOC-SLE president thanked all delegates for their support and trust they accorded him, as he stated that 2018 was a successful year for the Committee and Sierra Leone whiles he looks forward to the challenges ahead in 2019. “We were able to participate in the Commonwealth Games and the Youth Olympic Games.So for me, 2018 was a success,” he said and called on members to be thinking about who to replace him as he will not go beyond two-term of administration. As part of his plans in his second term, the re-elected NOC-SLE boss promised more training programs for coaches and called on the participation of more women in key positions and also called on female members to be more proactive. “Let me use this opportunity to advise all association to put better structures in place and continue to work as a team. All Secretaries and Presidents should ensure they know what they are doing to achieve success at the end, ”Dr. Patrick Coker said and highlighted the OlympAfrica Centre in Goderich as one of the keys among other structures they put up during his first term with an accolade to both the Ministry of Sports and the International Olympic Committee. Deputy Director of sports, Lambert Sesay, expressed his delight to attend such a program, adding that both the ministry and the NOC-SLE are a strong force which cannot operate without the other. Sesay branded that NOC-SLE as ‘biometer for sport in the country’ while he affirmed the ministry’s continued support and openness to working with the committee for the development of sport in the country. The Deputy Director of Sports, while congratulating the NOC-SLE for a successful congress and the winners, he urged them to ensure a better structure among sporting bodies and also decentralising the different sports in the country. Like Dr. Coker, Abdul Karim Sesay and Prince Vandy Sullay were re-elected as Vice President and Treasure respectively as Oness Johnson and Idrissa Massaquoi were elected as Ex- Officio. Meanwhile, the Congress excluded both Sierra Leone Cycling Association and the S Boxing Association due to their internal problems.